QuakeHold's state-of-the-art products help secure ceramic and glass pieces, pictures, glassware, crystal, collectibles, and more in the home, studio, gallery, office, classroom — even at art shows and museums. Inexpensive and easy to use, QuakeHold! has developed products specifically for use on glass, wood, walls, and other surfaces, for temporary or more permanent installations. Crystal Clear Museum Wax — QuakeHold! 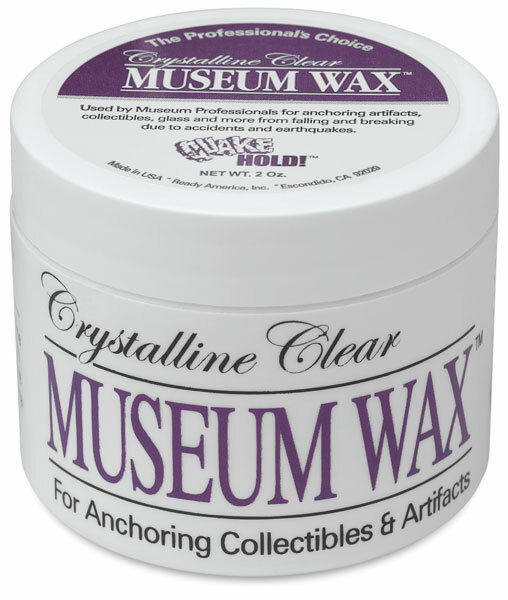 Crystal Clear Museum Wax is a microcrystalline product in the same formulation museum conservators have been using for years. Specifically designed to provide an instant grip for collectibles, artifacts, and more on wood surfaces, it secures objects while protecting the wood, and is removable with mineral spirits. This product is intended for more permanent installations. To use, simply scoop out a small amount of Museum Wax from the jar, roll it into balls, apply it to the bottom of the object, and then lightly press the object onto the surface. A 2 oz jar secures up to 100 average-size items. ™ QuakeHold! 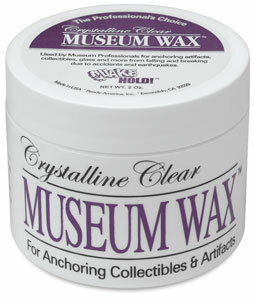 is a trademark.™ Crystalline Clear Museum Wax is a trademark.